Most effective rust removing gel we've tried. Finally, a safe and effective rust remover for removing rust from rusted steel and iron. Rust Release SuperGel is the safest and most effective rust removing gel we have used. In selecting a gel, we wanted a product that would remove rust on flat surfaces, angled surfaces and even vertical surfaces. Rust Release SuperGel has exceeded our expectations for removing rust from all steel/iron surfaces. Use on just about any steel or iron to remove rust. Recommended for metal surfaces that are too large to immerse in liquid. It can be used on automobiles, sheet metal, tool, and other parts. Rust Release SuperGel is very cost effective to use. The gel can be applied on just the rusted areas so there is little waste. Also, when you compare our Rust Release SuperGel to other gels, it costs much less per ounce. Removing rust with acids is old technology. Rust Release doesn't use acids so there is little risk of harming the metal or the surrounding area. 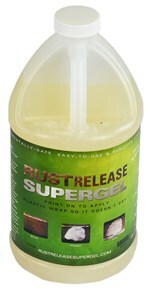 Rust Release SuperGel can be poured, brushed or rolled on to your rusted surface. Unlike liquid rust removers that run off angled or vertical surfaces, the SuperGel can adhere to most surfaces. If you're applying it to a vertical surface, you may experience some running with a thicker coat so applying a second coat may be required if the first coat doesn't completely remove the rust. Expect rust to be removed in as quickly as 15 minutes for very light rust. Moderate to heavy rust may take a few hours. Because it is not an acidic rust remover, longer exposure to metal will not harm the metal. For longer application times, we recommend applying indoors to reduce evaporation. Sold in half gallon containers. Q. I have heard of a jelly type product in the past for rust removal. Is yours similar? A. Ours is unlike other rust removal jellies. Other products on the market use acids to remove the rust which is not only less effective but also less safe. When you compare the price per ounce, ours is much less expensive. Q. Can you remove rust from a vertical surface with your rust remover gel? A. We have had great success in removing rust from vertical surfaces with the SuperGel. It isn't as easy to apply and it will drip if applied too heavily, however, it will still remove the rust. We have not found any other gel or spray to be as effective in solving this difficult problem. Q. Can you remove rust on the underside of a car with the gel? A. The gel does not have enough adhesion to stick and not drip when applied on the underside of cars. Q. Will it remove rust stains on concrete, tile or porcelain? A. No. It is for removing rust from metal. It is not for removing rust stains on non-metal surfaces. Q. I need this quickly. Can you ship Rust Release SuperGel by Air? A. Yes, unlike other harmful products, this product can be shipped by air if you need if fast, however, our same day shipping can get it to you quickly so shipping by air is seldom necessary.